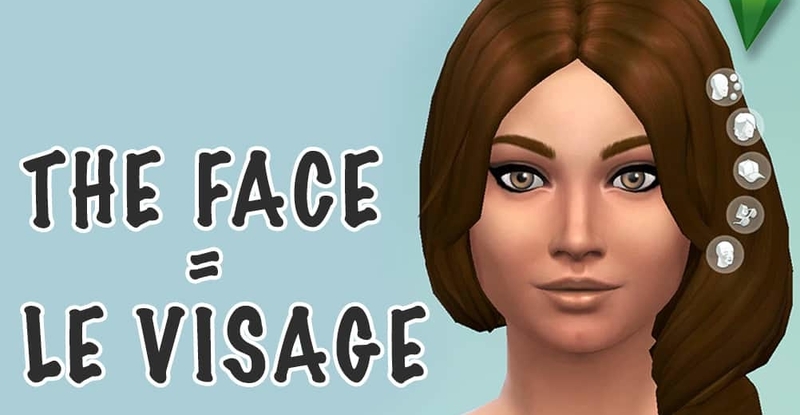 Let’s learn the French vocabulary about the face, and then see it come alive with my video featuring “the Sims”, a popular video game. This article includes the French face vocabulary with English translations and a fun video with audio to learn the correct pronunciation of the French face words. Le visage is located on “la tête”. The face is located on the head. On top of “la tête” is a special kind of hair called “les cheveux” in French. So you need to be careful because this is different from English. You would say “Ses cheveux sont longs”, “ses cheveux sont bruns” using plural verbs and adjectives, when in English, you’d say “her hair is long, her hair is brown”, using a verb in the singular. Watch out also not to mistake “un cheveu” and “un cheval”, “des cheveux” and “des chevaux” which are horses – a word you already know if you watched my 11 years old bilingual daughter Leyla’s video describing the farm animals in French using another popular video game: Minecraft. Look for it on the French Today youtube channel. Ok, so back to “le visage”. le nez – nose. Z is silent but makes the e sound é. In the plural, there is no s – un nez, des nez. Un oeil – one eye – has a strong liaison in N.
Les yeux – In the plural, you will almost always have a Z sound starting the word “z-yeux” because of the word which comes before it, and the liaison, so you may as well memorize the sound “zieu” for it. And then, another strange word : “un cil”, des “cils”, this time with the final L pronounced : the eye-lashes.